I've mentioned it in a few recent posts. 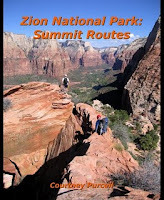 While visiting Zion NP, I stopped off at the Zion Adventure Company store located just outside the park and bought a copy of Courtney Purcell's book "Zion National Park: Summit Routes." He's amassed quite an assortment of hikes throughout the park. I'm mostly interested in the ones on the east side, but now I might try a few others.